If you’ve been searching high and low for the perfect personalised mother necklace, this may be it! Or Heart Necklace in Gold Plated with Semi-Precious Gemstone sends a loving message while treating the wearer to a gorgeous accessory that pairs beautifully with just about anything. Just right for mum, grandma, your sister, or even your favourite aunt, this stunning piece is so pretty that you might just want one for yourself, as well! Offering the gorgeous glow of gold plated jewellery, this necklace offers lots of unique touches that make it one of a kind. Start by deciding how you’d like to personalise the heart pendant. There’s room for kids names, initials, dates, meaningful words, or your own name along with that of your significant other. Feel free to be creative! 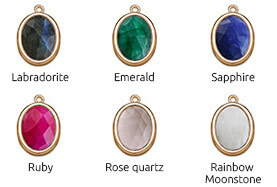 Next, decide which of the semi-precious gemstones you’d like to add. If you prefer light colours, you might like white rainbow moonstone or pale pink rose quartz. If brighter tones appeal to you, you’re likely to appreciate the green of emerald, the deep pink of ruby, or the mysterious blue of sapphire. Choose labradorite if you love the contrast between black and gold! This delightful necklace is made with 18ct Gold Plated 0.925 Sterling Silver. The pendants hang from our New Beaded Chain, which is also made of Gold Plated Sterling Silver. We invite you to view our heart shaped necklace collection for additional options, including this sweet style in your choice of Sterling Silver or 18ct Rose Gold Plated. There’s lots to love!